Bullets flew and scuffed up snow. The Wabbit and Wabsworth couldn't see a thing but they dived for the ground and threw the only ammunition they had. Snowballs rained. Lapinette jumped from the bridge and took the full force of a snowball. It had been a long trek through the snow and she stumbled. Thrown off balance, her snazer fired randomly into the sky. A cry of pain echoed from the woods accompanied by a brace of angry bullets. The Wabbit rolled away and crashed on Wabsworth's feet. "Whoof!" For an android, Wabsworth had a handy range of expressions. Snow scattered as they tangled. The bridge creaked suddenly, announcing the end of Skratch's measured pursuit. It was just in time - and he pounced in the air to deflect two more rounds. This time the cry was anguished and their adversary fell silent. 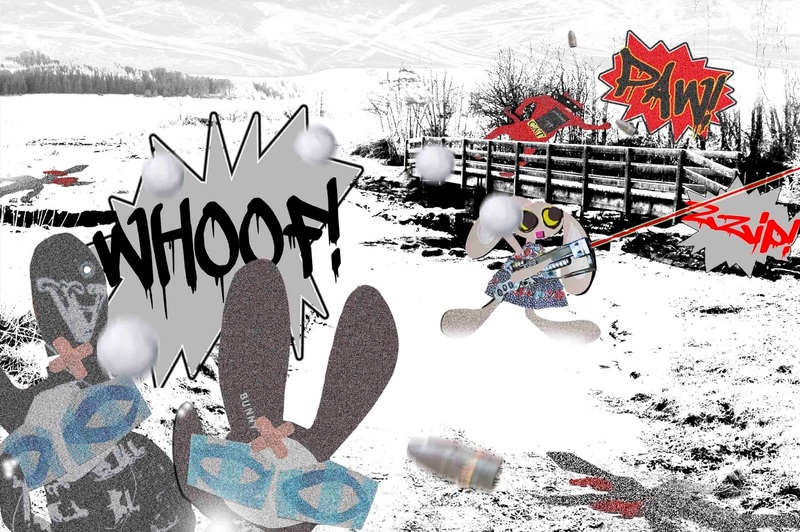 "It doesn't like close up work," yelled the Wabbit and he stuck his head up. "But it's tough as old boots!" yelled Wabsworth. He pulled the Wabbit down and it wasn't a moment too soon. A bullet streaked past the Wabbit's ears and dug a deep hole in a rock. "I've got a plan," croaked the Wabbit. Wabsworth kept a foot on the Wabbit's chest and took a chance. He stood as tall as he could and made a circular motion with a single paw. Lapinette and Skratch vanished as quickly as they'd appeared. "Split up," hissed Wabsworth. There was no reply. The Wabbit was already on his way.